Halloween Ghosts and Goblins In Your Trailer? Maybe you need to say the same thing to those ghosts in the horse trailer. If you are tense while loading your horse, he senses “you believe there is a ghost” inside. If you as his trusted leader are afraid of that ghost, then your horse is a true believer and really thinks a ghost is in there. The next time you go to load your horse, chase away those ghosts. Mentally decide you are going to walk into that trailer and the horse is going to follow you right inside. Take the horse and boldly walk towards the trailer with the door open. Don’t pause, just walk straight in and don’t wait for the horse. Just expect him to follow you. If you think there still might be a ghost, then keep singing the song. Seriously, if you are trying to load a horse and don’t demonstrate fearlessness, you are creating ghosts for your horse that don’t exist. You are telling scary stories late at night and the horse believes you. Caveat: Horses in small areas can be harmful to your health. If you don’t know what you are doing, get some professional help. If you have loaded horses in the past without trouble, but have a horse now that is hard to load, make sure you aren’t the problem by telling him ghost stories. In order to have success with your horse, there must be trust and confidence in the rider. If the horse doesn’t have full confidence in the person doing the driving, problems can arise. The more a horse is trained and ridden by the same person, the more the horse is likely to trust that person. It doesn’t necessarily mean the horse will accept direction from someone new to the horse. Part of our training is to develop horses for YOU. So training includes changing riders as much as possible in the later months of the program. We often place a new person on the horse to monitor additional training the horse and sometimes the rider may need. Here is our Summer intern working one of the horses to see how he will react to someone else. Just recently, we had a situation with horse that had undergone extensive tarp training with the tarp placed over his head while under saddle. The tarp was shaken, dragged, tossed in the air, and finally thrown over the horse’s head while being ridden. The point was to work on desensitization. The horse passed with flying colors. However, a few weeks later with a completely different rider that the horse didn’t fully trust resulted in him flinching when a jacket was removed while headed down the trail. He didn’t spook or panic, but he stepped away as the coat came towards his neck. We already knew it had nothing to do with the object as he was used to tarps. The test was a good one as it showed he still needs some work learning to trust other people. It is one reason we look for interns from the veterinary and equine schools to help out and actually test the training work we do. Just like the fire department, we use real life simulations to see how the horse handles a situation and to watch for areas of additional training. We also like to stress to people new to horses that just because the horse will respond to the trainer doesn’t mean the horse will act the same way for them. For the horse, a new rider is a lot like being the passenger in a car. Sometimes you don’t trust the driver until you have ridden with him for a while. Horses don’t always have confidence in a new person and need time to decide if they should trust their judgment and decisions. Some horses are naturally more trusting than others and some riders demonstrate good leadership that instills confidence faster than some. Bottom line: success occurs when the rider inspires the horse to undertake a task or obstacle without fear or concern for rider’s judgment. Losing Hope of Finding the ” Right ” Horse? We offered her some polite comments that might be useful to others looking for that perfect horse. Every buyer is part of the communication process that is either a success or failure. No doubt there are unscrupulous horse traders willing to sell you a heavily medicated outlaw, but there are also buyers who don’t really know how to articulate what they want. A buyer should sit down and spend a couple of hours day dreaming about everything they plan to do with the horse AND WRITE IT ALL DOWN. Armed with these, hopefully detailed plans, the buyer should be able to develop some detailed points or outline of attributes for their purchase. Unfortunately, we often hear comments, like I want a really good horse that’s gentle. Vague and undefined terms like ” good ” are meaningless in communication because ” good ” means something different to everyone. Don’t believe me, head down to Starbucks and ask the people standing in line to order you a ” good ” cup of coffee. When you come to understand how many cups of ” good ” coffee are available, you will be on your way to the realization that ” good ” horses are everywhere depending on the other guy’s definition of a good horse. If you have questions, let us know. We recognize a novice horse buyer may not know what they are looking to buy and we are happy to offer things our horses are expected to do. More importantly, we believe people need to ride the horse several times before they purchase and make sure the horse really is their dream horse. 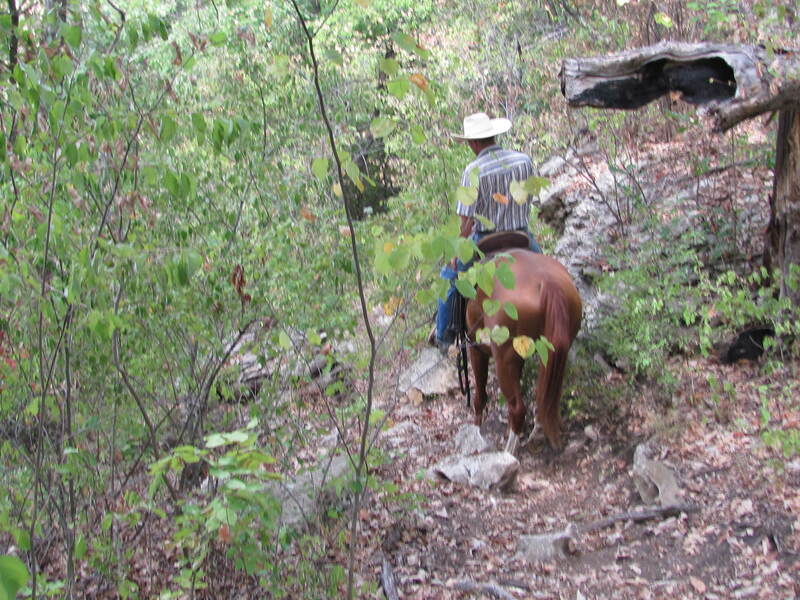 Trail riding offers solitude and an opportunity to relax. Cell phones, computers, e-mails, and demands of the job can leave you wound pretty tight and ready to strangle people. 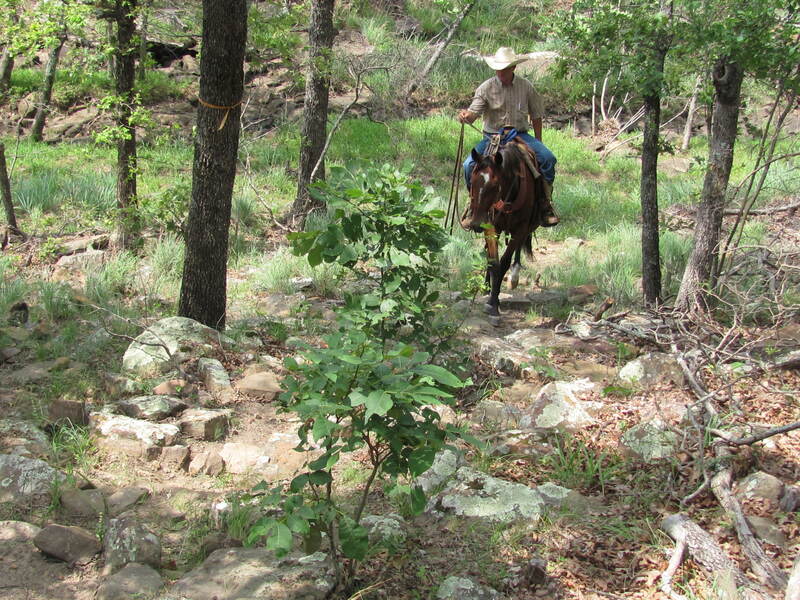 A little quiet time on horse back on the trail reduces stress and restores the sanity you lost at the office. You can’t beat the effects on your attitude and mental outlook. Better and less expensive than a psychiatrist, horse back riding will give you a new outlook on life. If you find your life is full of stress, do something about it. Get on a good horse and head down the trail. The fresh air, sunshine, and beauty of nature will lower your blood pressure, help you sleep, and improve your life in countless ways! We have owned or ridden nearly every breed of horse out there. 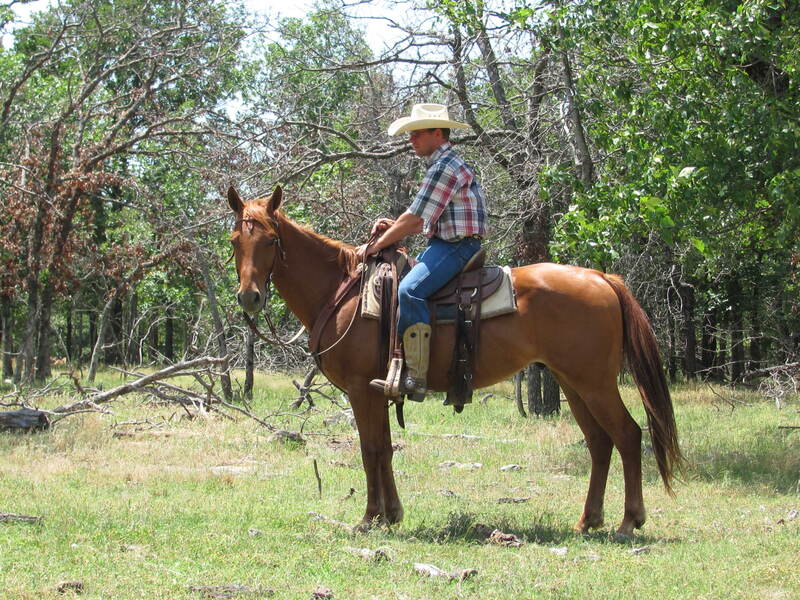 So why did we select the American Quarter Horse for the trail horse of choice? Several reasons come to mind, but admittedly we live in Oklahoma. It’s quarter horse country! More importantly, the Quarter Horse has the mind, attitude, personality, willingness, and athletic ability to do the job. 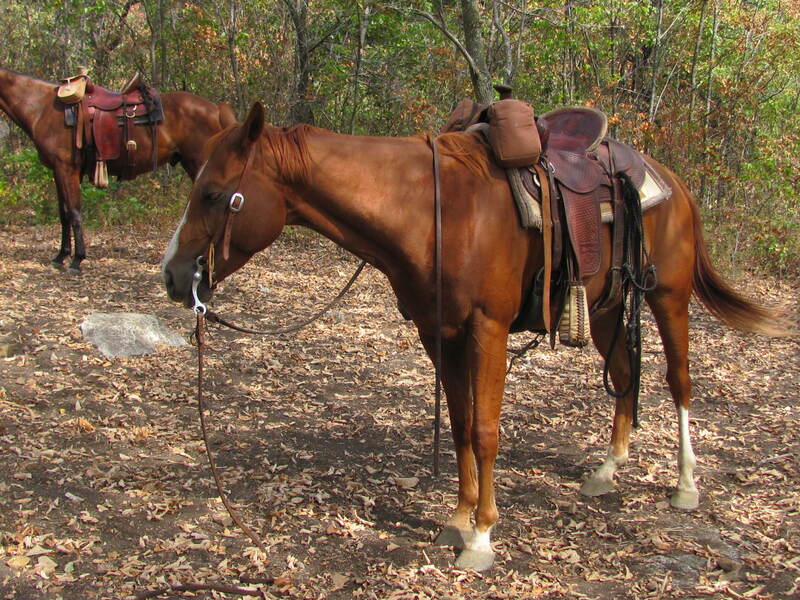 Trail riding requires more self-control from a horse than almost any other activity or event. Surprise you! Well think about it for a minute. Trail horses are required to maintain self-control in all sorts of situations. They are ridden in rough terrain with natural predator wildlife such as cougars, wolves, etc. and expected to safely take their rider where he wants to go. These horses are ridden in rescue work, parades, and around countless other events. 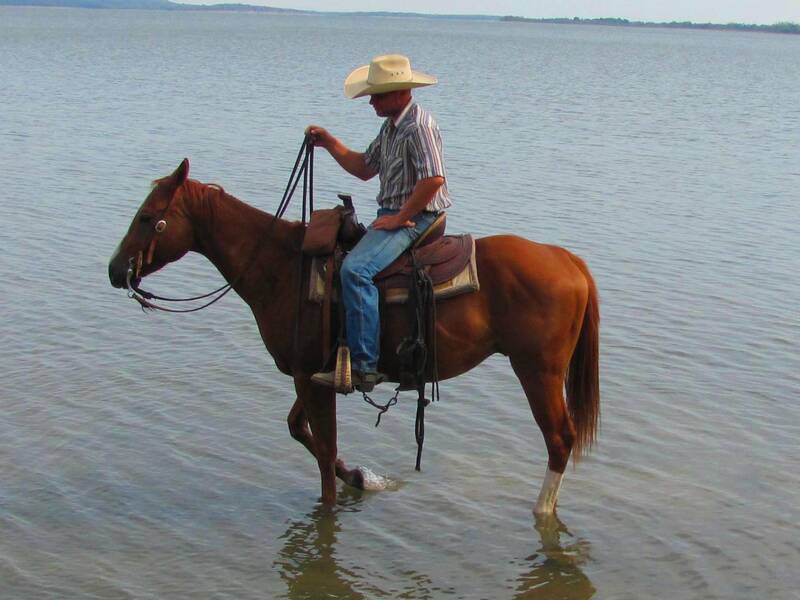 There are great mounts in every breed, but the Quarter Horse combines the best from our view. They work hard and enjoy the task at hand. Willing to attempt nearly anything, they still retain a good sense of their surroundings and the situation. They learn fast and remember what you taught. Although there are benefits to every breed, the American Quarter Horse is our preferred choice. We want to give Sarah credit for a couple of things. First, she recognizes a ” green horse ” can be dangerous. Second, she is knows the importance of riding within her ability. Both are key components to safe horse back riding. 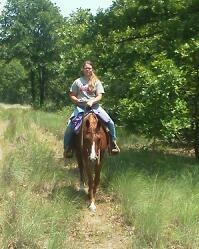 We love to ride the trails and use them to train our horses. In our view, those long days on the trail bring countless benefits for the horse and set the stage for teaching the horse all sorts of things from neck reining to standing quietly when offered the opportunity. We were really glad to see Sarah’s later post detailing a trail ride and the fun she had. There’s absolutely nothing better than a day on the trail on a good horse! You are currently browsing the horsesfortrail blog archives for October, 2012.